Give your creativity space to grow. VEGAS Pro 14 guides your video editing projects with its intelligent workflows and industry-leading audio editing tools, putting professional standards within easy reach. Native support for HEVC and ProRes file formats lets you place all common formats alongside one another on the timeline – even video from RED cameras. VEGAS Pro 14 gives you more editing power than ever before. With new velocity limits, you can create fast motion that’s 40 times faster than normal speed. New hover scrub capabilities make marking in and out points and adding footage from the Trimmer much faster and more efficient. That leaves more time for your main goal: creating impressive videos. Make shaky footage a thing of the past. Rescue material you thought was unusable and optimize it with proDAD Mercalli V4. Stabilize fisheye images or videos from your digital camera, action cam or 3D drone cam. The dynamic zoom-in function lets you create smooth, stabilized videos without impairing wide-angle shots. Create titles, captions and closing credits in broadcast quality with the NewBlueFX Titler tool in VEGAS Pro 14. Give your productions extra polish with sophisticated animated titles to brand your projects with your unique style. Enhance the appearance of your footage with stunning video looks from NewBlueFX. Select from Film Color, Color Fixer Pro, Gradient Tint, Spotlight and Glow Pro. 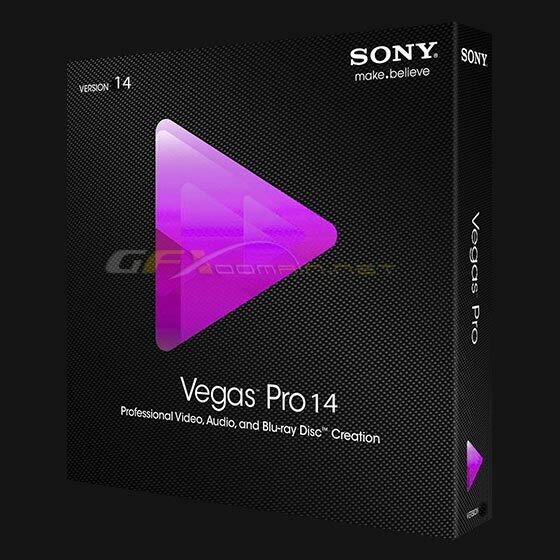 VEGAS Pro 14 supports you right from the import and through to the finished disc. The included VEGAS DVD Architect gives you full control – from label design and menu controls to encoder settings.